Was born 1961, London. BA (Hons) Fine Art (Sculpture) from WSCAD, Surrey, UK (1984) and M.A. Fine Art (Sculpture) from Chelsea School of Art, London, UK (1985). Currently I am a PGR student at Northumbria University in my third year of a practice led doctorate investigating Synchronicity and Consciousness in Improvisatory Performance Art Practice. I have lived and worked in Spain since 1987 and have been making live art works internationally for over 30 years. In 2002 i co-founded Gresol, a non-profit making cultural association, and since then, I have organised over 20 International Performance art festivals in Girona and Barcelona, including FEM, an annual festival showcasing the work of women performance artists, now in it’s 14th edition. 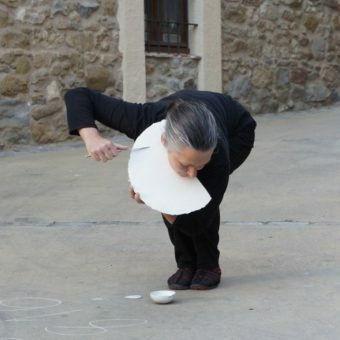 I am a member of the international performance group The Wolf in the Winter and a founding member of the EU funded project ELAA (European Live Art Archive) based in the University of Girona. I am founder and coordinator of Corpologia, a regular performance practice meeting and I edit the magazine of the same name. In group performance works, I have experienced over the years how we can enter into a permeable space where our thoughts and imaginings are connected in an inexplicable way beyond the constraints of time and space. This connection seems to allow for the rapid transmission of ideas, images, concepts and gestures between the people in the group. This has inspired me to think about how much of our action is directly and constantly effected by the people around us in an infinite loop of interference and influences. My current interest lies in exploring how interconnectedness can manifest in events of synchronicity. At the outer limits of scientific discovery, our dualistic way of looking at the world is crumbling and there are mysteries and anomalies that can only be expressed in metaphorical and artistic ways. I am interested to see how we can expand this experience of «being with others» to a «being for others», allowing authorship and ownership to slide and exploring a porous and amorphous cohabitation, a radical generosity that acknowledges the other in us and us in the other. I’m also looking at how Classical Chinese texts and Practices can shed light on the process of preparing for and the making of improvised performance works.